Every Sip Takes us a Step Closer to Curing Lung Cancer. 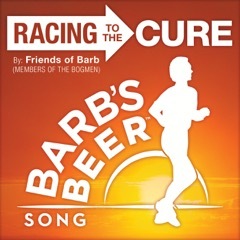 Members of a highly popular NY band, ‘The Bogmen’, created a song for Barb’s Beer called ‘Racing to the Cure’ (our Barb’s Beer Song). P.J. O’Connor and Brendan and Billy Ryan, took lyrics by Tom Murphy, Barb’s husband, added a warm, inspiring tune and perform the song as, “Friends of Barb.” Preview our Barb’s Beer song below, then download it to support the Barb’s Beer cause! Barbara Murphy was a great runner. She was a talented interior designer and a wonderful wife, mother and friend. In 2007, Barb was diagnosed with non-smoker's lung cancer out of the blue and fought it valiantly before passing away in December, 2013. She never complained. Instead she focused on doing what she could to create awareness for this disease which afflicts a quarter million Americans a year, including 30,000 people - mostly women - who like, Barb, never smoked.